Ophthalmology Fellowships in the University of Louisville’s Department of Ophthalmology & Visual Sciences provide extensive clinical and research experience, with the objective of graduating highly qualified & well-rounded clinicians, researchers and educators. Current fellowship training combines outpatient, inpatient and surgical experience in Vitreoretinal Surgery, Medical Retina & Uveitis as well as Oculofacial Plastic and Orbital Surgery. It’s our goal to foster physicians who will continue to renew and improve themselves as their careers progress—we’re graduating the next great minds in ophthalmology. 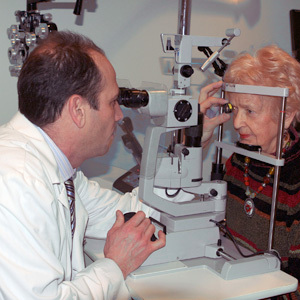 As the top eye specialists in the area, we receive a majority of the region’s referrals. This means fellows experience a wide spectrum of cases, from the very simple to the most complex, with an extremely varied patient population at our various facilities and practices. Each fellow’s strengths are carefully evaluated to ensure their talents and natural aptitudes are best utilized and cultivated. Fellows study directly with leading experts in the field. They collaborate closely with our dedicated faculty, who provide guidance, mentorship and research assistance. There is a careful balance of supervision and autonomy. Faculty members are always available to help and teach, but fellows are also afforded opportunities to work independently when appropriate. Fellows participate in both clinical and bench research, with all equipment, lab space and technician support provided by the university. Fellows are encouraged to publish and present their research at regional and national meetings. Faculty members are available to assist and offer guidance whenever needed. Upon completion of their program, fellows go on to prestigious jobs in academic medicine, research and private practice. Past fellows have found success in positions at Indiana University, University of California-Irvine, State University of New York Downstate, Tokyo Medical College, Beijing Tongren Hospital and the University of Louisville, among others. The University of Louisville Department of Ophthalmology & Visual Sciences fellowship programs are in compliance with the Association of University Professors in Ophthalmology Fellowship Compliance Committee (AUPO-FCC) Guidelines.